Design the right signature for your organization – Create a bespoke email signature for your organization or choose from numerous template designs in the comprehensive library. Create signatures for departments – Create rules so every user gets the correct email signature for their job role. Use all Office 365 email signatures in a way that best suits your business. Multiple signatures for multiple purposes – Let all Office 365 users choose which email signature they wish to use, whatever the circumstances are. Use one email signature for a certain geographic region and one for a specific industry like healthcare or legal. 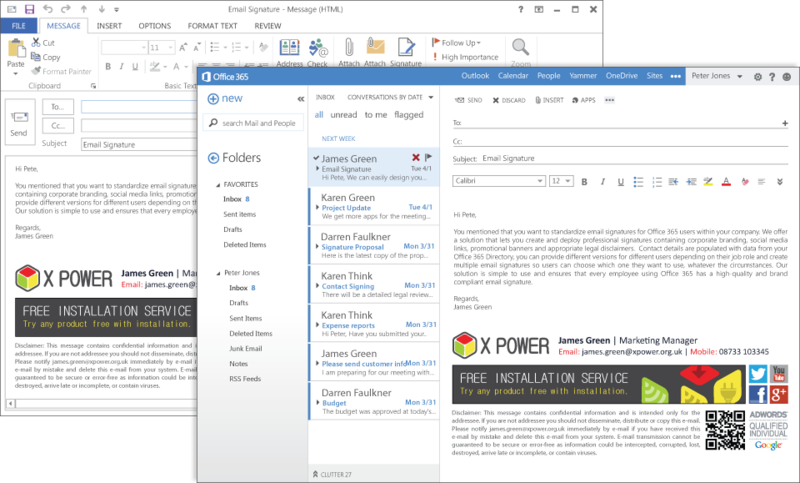 Install on any workstation – Signature Manager Office 365 can be installed on any Internet connected machine and comes equipped with a dedicated console for easy email signature management. Take all user details from Office 365 Directory – Ensure all users’ Office 365 email signatures have the correct contact details through integration with your Office 365 Directory. Amend email signatures with one click – Once a signature policy is saved, all users get the correct email signature via the click of a button. Simple to setup – All you need is a Windows OS (Operating System) to begin creating professional Office 365 email signatures. Different designs for email replies – Include more useful information for employees such as internal extension numbers or a location within an office. Award-winning quality – Signature Manager Office 365 Edition uses the same multi award-winning email signature technology as Signature Manager Outlook Edition and Exchange Edition. 100% accurate email signatures companywide – Never worry about blank fields appearing in any email signature as the software automatically detects if contact information is missing. Consistent email signatures – Manage the color, size and style of all signature fonts to maintain your corporate branding. Test all signatures thoroughly – Check all of your email signature policies work before deploying them to Office 365. The graphical interface of the software’s Policy Tester lets you see clearly who is getting which email signature. Many employees expect to be able to see their email signature as they type a message. If the email signature has promotional content, it becomes important to sales and marketing teams that they can see their signature. With dedicated Office 365 email signature software, all Office 365 users can see what their email signature looks like whenever they compose a new email. Email signatures will also always show under the last email a user has sent. Showcase special promotions and marketing activities with email signatures – With Signature Manager Office 365 Edition, every Office 365 email becomes a powerful marketing opportunity. Add promotional banners that are scheduled to be live for a set period of time. Once the activity is completed, the software will automatically update or remove it as needed. Add preconfigured social media elements – Your organization most likely has a social media presence. Use the software’s ‘social media strip’ , complete with interactive icons, to increase your followers and fans. Protect your organization by complying with email regulations from various countries with a full legal disclaimer on all email signatures. Avoid receiving stiff financial penalties, warn recipients about the risks of computer viruses, cover confidentiality breaches and more with a dynamic disclaimer.